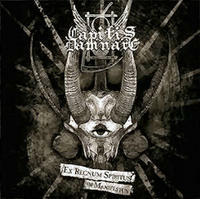 CAPITIS DAMNARE’s second full-length “EX REGNUM SPIRITUS IN MANIFESTUS", 8 tracks of unusual Black/Death Metal! A total mass dealing with necromantical, demonolatric powers and the proclamation of total satanic supremacy! A must to all most Underground worshipers.